Hello! I hope this finds you planning a fruitful garden year. joining the team at the Britain in Bloom ceremony in Belfast. We were awarded GOLD in the large town category. This will be held at the Cricket Club Pavilion on Penrhyn Avenue,10am-12. We will have a talk from David Masding on the history of Bodnant Garden. After this we have a short AGM during which the committee will feed back on events through the year and a new committee will be elected. We are always looking for new members on the committee and are keen to hear everyone’s ideas for the society. As always there will be refreshments and excellent cake. Enclosed is your show schedule. Have a flick through the categories, feel inspired and do have a go. We need to have your entry list the Monday before the show. The society has worked with Colwyn Bay Town Council for many, many years. For the last 18 years we have had at least one of our committee serving on the Colwyn in Bloom Committee and on the newer Volunteer Awards Committee. At the moment this is Hannah. This year was a very special one. We hosted the Wales in Bloom award ceremony with prizewinners from throughout Wales joining us. The event was held in The Barn at Parc Eirias and our contribution included a history of the society leaflet given to all. Colwyn Bay Floral Art Society did a beautiful display with a Welsh dragon for the trophy table. Roualeyn Fuchsias from Trefriw had fabulous fuchsias on all the tables and a display about the nursery which exhibits at all the major RHS events. Our guests were treated to a trip along our developing waterfront and up to the Zoo to see the gardens there. We were proud to be awarded a Silver Gilt for Colwyn Bay. We were then invited to the Britain in Bloom awards ceremony held in Belfast, an honour that only happens every few years. We were absolutely thrilled to be awarded Gold. There is a video of the ceremony on our facebook page. The work our horticultural society does with our shows, the plant sale and other events forms part of the presentation to judges and is praised for the number of people and mix of ages that we encourage to garden. The photographs from our website are part of the judges’ pack. Every year the judges hope to see a little more on their Colwyn Bay tour so do let us know if you have any ideas or know of any extra special private gardens to include. As part of the judging there is a tour of Colwyn Bay, visits to local schools and groups that garden. They see the work at Bryn Euryn nursery, meet our recycling team (Conwy Council leads the way in Wales and the UK) and then meet groups and volunteers at the Town Hall. The Volunteer Awards Committee was set up recently to recognise the work done by the many individuals and groups who work hard in our community. Each year nominations close on January 31st. All those nominated are invited to an awards ceremony at the Town Hall. The school are running a DIY SOS type day improving their gardening area for the younger children. This is on Saturday 16th February. If you are able to help or donate plants, wood or large tyres please contact Mrs Elizabeth Roberts at the school. Hello! It is a bit nippy at the moment so after checking out the Show Schedule why not curl up and take a peek at the pictures on our website for a bit of gardening inspiration? The Autumn Show was officially too big. Well at least that is what I thought as the plant stall had to be in the foyer. We had over 400 entries with 100 more than the previous year. Plenty of the entrants were showing for the first time and deserve much praise for that and their standards were very high. The age range of entrants ranged from 6 to 89 making us a truly intergenerational society. Vegetable entries included several pairs of lemon cukes, grown from the cucumber seeds given out at the AGM in March. A fine pair of carrots took Best in Show. The household objects held imaginative floral displays and the Autumn wreaths were exquisite. The roses made the whole hall smell wonderful. In Home Produce the puddings made with Autumn fruits were incredible and Anna Coleman proved that youth is no barrier by winning first prize for her Victoria Sponge which is always a highly contested category. The standard and number of photographs increased again, challenging the judge. Our Autumn Garden, Craft and Wildlife event was well attended and there was plenty to do, make and see. Greetings cards with leaf prints were very popular to make. Wreaths were made from coloured willow stems. Bulbs were planted and succulents propagated. Our guests included Joy from the RSPB, Aubyn Designs making beautiful paper flowers, Sarah Gorst with her creative and colourful knits and Andrew Jenkins painting. This will be held at the Cricket pavilion on Penrhyn Avenue, 10-12. We have a speaker, Kevin Bailey, who will be sharing his enthusiasm for cacti and succulents. After this prickly entertainment we have a short AGM during which the committee will feed back on events through the year and a new committee will be elected. We are always looking for new members on the committee and are keen to hear everyone’s ideas for the society. As always there will be refreshments and excellent cake. Enclosed is your show schedule. We do hope that even more of our members will be able to enter. Have a flick through the categories, feel inspired and do have a go. We need to have your entry list the Monday before the show. We have had some interest from members about opening more gardens. Do let us know if you fancy doing this. We will help out beforehand and on the day. Our insurance covers us if we open to our members and do not charge. Mrs Bennington must be one of our oldest members and is often seen at our events in a lovely green coat and hat. She has a wealth of horticultural knowledge and we thought it would be interesting to find out where her interest and enthusiasm came from. At 5 years old she was growing carnation cuttings with her mother and was soon in charge of Mum’s Coltness Dahlias. By 10 she was growing large velvet pansies with the help of an uncle who supplied old manure. Visits to the family farm at Mickle Trafford involved caring for the orchard, hanging crows on gates and making parsnip and potato wine. When her father worked at Ford Dagenham the Essex climate and soil allowed for very long runner beans and a rather too scary view of The Battle of Britain from a nearby golf course. After being blitzed out and an offer of work at Ford Manchester, the family moved back to Sale near Altringham with its cool and acid soil. Gardening continued with a Didsbury allotment. As a volunteer at Tatton Park, Joan was involved with the Plant Heritage Society and is credited with finding the first pure white foxglove. She was a founder member of the Manchester Flower Club. Joan taught classes on horticulture for the older people of Stretford. She was very involved in the Henry Doubleday Society, now called Garden Organic, using the ideas to tackle club root and develop composting in Manchester. The Alpine Society was another active interest. In the 1980s they moved to Rhos on Sea and she is still in the same house. Her son shared her zest for life and was very active. Sadly, he died when climbing Ben Nevis. He was only 23 years old. Her garden continued to be very important to her. She introduced the Plant Heritage society to the area. The garden was opened to the public under the NGS scheme and in 1991 was visited by Channel 4 and Roy Lancaster. The garden slopes up from the house and is close to The Bryn. It features the dahlia ‘Princess Marie Joesy’ that is part of the national collection. 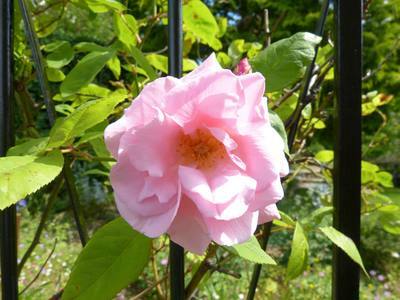 The roses ‘Phyllis Bide’ and ‘Teasing Georgia’ are well established along with a rose that is also found on Rudyard Kipling’s Grave. In planting the garden she recalls one expensive mistake, planting an oak tree like one of those on The Bryn. It was far too happy in the garden. It cost £500 to remove and it caused a wall to fall down. It was a pleasure to explore the garden and to hear the history behind it. Thank you very much. Hello, Spring was very busy for the society. The AGM had reports of a successful year and the committee was duly elected and all seemed enthusiastic. The highlight of the morning was the talk on bees from Barry Griffiths, the chairman of Conwy Beekeepers. He had plenty to tell us and he showed us pieces of comb and some fabulous pictures of his own bees being busy. On April 23rd members went for a Spring visit to Mostyn Hall Gardens. Always interesting and informative with the kitchen garden and produce made from their own crops. Our Spring Show featured moments of revolution with the Forder boys finally taking the children’s cup from the Fleet sisters. Young Gethin Coleman took on the adults and won firsts for eggs and bread making. He was very pleased to beat his Dad. New member, Judith Neale, stunned us with exquisite crafts and Jaqui Jones who has run the show for years has finally had chance to enter and won best in show for her Genoese cake, most of which the committee ate at lunchtime. On top of all this excitement there was a dandelion entered as part of one of the floral arrangements and, before you ask, it had been cultivated by the exhibitor for the requisite 2 months. Just as we were recovering from all that excitement we were asked to join in with Creative Rhos. This gave us the opportunity to promote the society among the knitted bunting, ukulele bands, morris dancing, local artists and much more that entertained the people of Rhos on Sea as they visited their village. Local traders had a very busy day as so many came to sample all the area has to offer. The May Plant Sale broke all records with sales of our homegrown plants taking well over £1000. Numbers through the door, new members and tonnes of cake eaten all increased. A very successful event ensuring funding is available to run future shows. On June 11th members visiting Pensychnant for the afternoon were shown the beautiful wildlife corner. 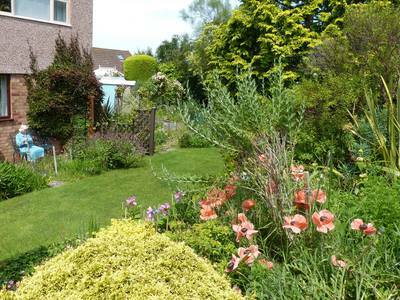 Despite the windy conditions, it was very peaceful in the garden and the tea and cake afterwards was much enjoyed. Pensychnant is a unique and charming place and credit should go to Anne and the supporters for the hard work done in maintaining such an important wildlife habitat. Enclosed is your show schedule. We do hope all our members will be able to enter this time. Have a flick through the categories, feel inspired and do have a go. We need to have your entry list the Monday before the show. We are already looking for interesting exhibitors for this. Every year we have a range of garden, home produce, craft and nature exhibitors and experts, usually including some that are not human. If you have any suggestions for any people or groups who might be interested in joining in please let us know. See what we do on our website full of photographs from events and on our facebook pages. Become more active by volunteering at events or joining the committee. What a lovely summer we have had. Plenty of sunshine, yet enough rain to keep the lawn green. We have had a very successful year so far for the society. The Spring and Autumn Shows gave a wonderful display of colour and talent with a combined 540 entries. One of the judges described the Autumn Show as ‘tidy’, high praise indeed. A productive AGM included a talk on propagation from David Cooper who generously shared his experience and included plenty of audience participation. The Ruth Cavill Cup was awarded to the society by Colwyn Bay Town Council for their contribution to Colwyn in Bloom in the Britain in Bloom competition. Ruth Cavill was Mayor of Colwyn Bay and was instrumental in galvanising the local community into improving the local horticultural landscape. The Plant Sale raised money to support our shows and provided plenty of goodies for us to nurture. Members had a very enjoyable visit to Mostyn Hall Gardens on 12th June. Rich in history and horticulture, there was plenty to see and Phil Handley enthusiastically explained the work going on there. Members were also treated to a delicious cream tea at the end of the visit with jam made from fruits from the walled garden. Yet again we have something different to share at this event. This year our visitors include Mostyn Hall Kitchen Garden, the Gwynedd Bat Group and moth expert, Julian Thompson, from Pensychnant. Bulb planting for children is back and lavender features fragrantly in our craft activities for all. Artist Sarah Kearsley will be showing her fused glass designs, these beautiful pieces would make lovely presents. The plant stall will be there too. Of course there will be plenty of homemade cake and refreshments for sale and the usual good company and chance to chat so bring a friend or two to join in. A trip only available to gardening societies, we have managed to secure an opportunity to tour the lovely Eaton Estate. These beautiful gardens are rarely open to the public so this will be a special treat. A guided tour has been arranged with refreshments to finish with. Arrangements will be made available nearer the date. Other events coming soon include the AGM and Spring Show in March and our Plant Sale in May. Well, be careful what you wish for! Our summer newsletter started with the wish “may your water butts never run dry”. Well there hasn’t been much chance of that. I have been quite taken by my own new water feature, an impressive waterfall that forms on my steps with water gracefully spouting from between the slabs. I hope the rain has not dampened your gardening spirit as we have some treats for you this year. Our usual report back from members of the committee with elections to posts and hopefully some ideas from you, our members, of things you wish to do. This year we have a local expert giving a talk on propagation. Mr David Cooper the former boss of Battys Nursery in Penrhyn Bay will be giving us some hints and tips on propagating plants. Hopefully resulting in us all managing to propagate some of our own favourites in time to sell at our May plant fair. We are hoping for an array of tulips and daffodils, creative crafts and tasty bakes. Take a look through the schedule and see if we can tempt you to enter something new. What about a photograph for any of these categories; ‘Feet’, ‘Where in Conwy Town?’, ‘Shhh....’ and ‘Garden Shapes’. Perhaps a floral arrangement based on a ‘Famous Painting’ or a table arrangement with the title ‘Colour Connections’. Maybe you can bake a perfect Bakewell Tart. Phil the gardener at Mostyn Hall is happy to give us an exclusive visit to the gardens to include the walled garden. This part of the garden is a social enterprise and gives access to all sorts of groups that could benefit from some outdoor activity. They grow fruit and veg and will be experimenting with cut flowers this year. The formal gardens also include good azalea and rhododendron displays. A visit will take about 2 hours plus. We will be looking for a suitable date over the next few weeks. If you fancy joining us let one of the committee know and look out for emails, info on facebook or the website and at our AGM. Hope you are enjoying the lovely weather and that your water butts never run dry! Welcome to our Summer Newsletter and the latest Autumn Show Schedule. This time we are asking that you encourage some of our younger members to enter the children’s section. Our regular contributors could do with some competition and a few are getting a bit old! The tasks are a Bunch of Flowers, a Picture of Cake and, my favourite, an Animal made from Vegetables. There have been some outstanding past entries; grasshoppers, marrow and celery legs, caterpillars, tiny apples on wire and, the best ever, the penguin carved from aubergine to give a white stomach. The photographic titles are Vegetables, Over the Hill, Summer Visitors and Rocks. This year the photography judge is to award one of his own prints as a prize. The florists have to conjure up a Gothic Revival and a Carpet of Colour for a table arrangement. Be inspired and enter your vegetables and home produce too. With the spectacular display of vegetables that greets you this show always inspires. We will be looking out for the Old Ivory Egg Tomatoes that were provided at the AGM. As usual the scent of roses will combine with those of fresh bread and cake. All very tempting. Refreshments will be available and donations of cakes always welcome, particularly prize winning ones. With something to do, make, talk about and explore for everyone, this event grows and grows. We are looking for more contributors to this varied event. Do you know a craftsperson, wildlife or garden expert or group that would like to join us and share their experience? Do let us know. The owls are hoping to be back again. A happy committee was elected and reports shared. All was well, but no one cared as we were too excited about seeing (and touching, Wendy) Medwyn’s gold medals! Yes, Medwyn Williams from Anglesey brought his Chelsea Gold medals to show us. He gave a lovely talk and it was so wondrous that I completely forgot to take a picture for the website, so no one will believe us! Despite an early show date and a cold start, people still managed to produce lovely blooms and daffodils. The floral challenge, Puzzlement, was tackled very creatively with Rubic’s cubes, Mastermind, crosswords, cryptic questions and question marks. Crafts and food looked great and the photographs keep getting even better. Did you enter? It was massive, so many plants for sale. Thanks to our show winners for even more contributions from prize winning growers. Many a smile seen over a box of goodies. More and more of our members are liking us on facebook. There is an official information page, Colwyn Bay Horticultural Society, that anyone can see even if they are not on facebook and a group, Colwyn Bay Horticultural Society Chat, that you ask to join then you can put up your photos and questions. This is only seen by the members. If you are on facebook and you haven’t shared a picture or comment then please do. The telephone numbers for the committee are in the show schedule. You can also contact us through the website by completing the form. This will email us and then we can email back. We are happy to chat at all events and should have badges on. The easiest way to keep you up to date is by email. If we have your email we can send information about events or trips and newsletters quickly and for free. Postage is a big expense for us and there is only so much Jon can deliver by bike! The website has details of future events, newsletters, blog, membership info, contact page etc. A gallery of pictures is regularly updated so keep it as a favourite. It takes a while to upload the pictures so please be patient and give it a couple of days after an event! Happy New Year and I hope you haven’t blown away! Welcome to our Spring Newsletter and the latest Spring Show Schedule. We hope for even more entries than last year. To get you thinking we have photographic titles; “The Garden in Winter”, “Where in Colwyn Bay?” “Afloat” and “Patterns”. The floral display is entitled “Dazzling Bright” and the table decoration “Puzzlement”. The home produce section has some tasty cakes to make. These change every time so feel free to suggest your favourite for next time. Don’t forget to renew your membership this year: we had well over 100 members last year. We normally start with a speaker or quiz. This has not been confirmed for this year yet but is usually entertaining. Watch the website for details. It's Medwyn Williams from Anglesey, ten gold medals from Chelsea. Heritage seeds will be available for growing and entering in the show. We will have discount cards for Snowdonia Nurseries too. Our AGM, usually fairly short, consists of reports from the committee sharing what we have done and hope to do, a check on our financial situation and the election of officers. Any nominations for positions need to be in a week before the AGM and we can co-opt committee members on the day. You need to be a member to vote but Jon will be there to renew memberships if you haven’t done so already. The committee is a happy group who share the work load so that there isn’t too much. At shows and events lots of other members help out on the day and we are very grateful to them. We encourage any members to get more involved at whatever level they are happy at. Always a colourful and popular event. See our previous shows on the website. Have a look through the enclosed schedule and be inspired to enter even more this year. This date gets more and more popular and many of our prizewinners at the shows donate their seedlings, cuttings and plants. With special plants that we know will thrive locally this is a gardener’s paradise and raises the funds necessary to keep the shows going. If you have any spare seedlings, cuttings or precious perennial divisions, then please let us sell some and share what grows well locally. Please label them with as many clues as possible. There will be refreshments and activities for all. 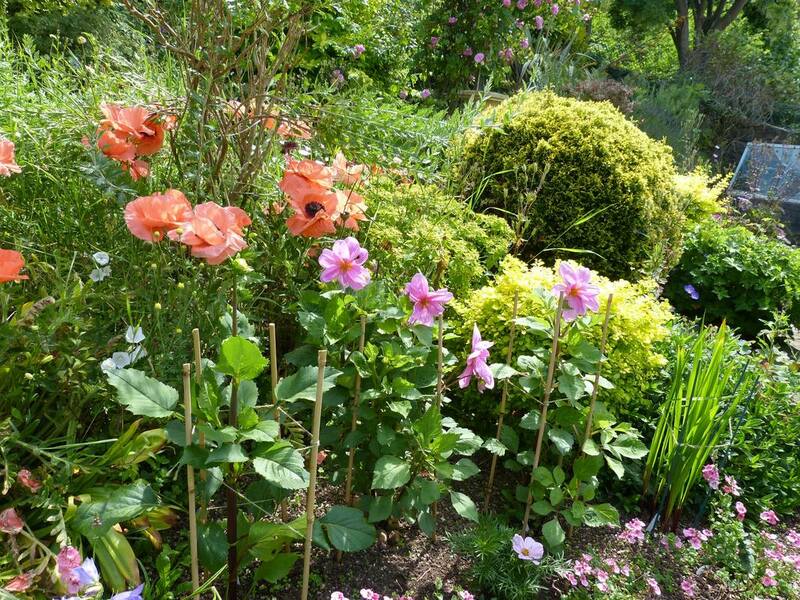 The trail in Rhos on Sea was very popular last summer and we are looking for volunteers with interesting gardens who would like to open to members this year. Gardens are not meant to be immaculate; works in progress are fascinating. Please let us know if you would be interested. They have offered loyalty cards to our members that will give 10% off anything in the gardening area, but not the coffee shop. We will have cards available for you at the AGM and Spring Show. Until then they are happy to give the discount if you show them your membership card. Over 250 entries of high quality. Many different members entered including some new to the show. As can be seen by the photographs on the website the quality was marvellous. A fabulous event with Sarpo potatoes, hedgehog houses, compost corner and Wendy’s wormery, an artist painting, bulbs being planted, a “Storm in a Teacup” competition and a whole load of creative Christmas decorations made. A lovely morning topped off with tea, cake and happy chat. A massive thank you to all who contributed and helped. Sorry to those that missed the owls we hope to have them back next year. You can use our new facebook page and join our group page Colwyn Bay Horticultural Soc. Chat for a chat and peek at what Caroline is growing for the May Plant Sale. Welcome to our Summer Newsletter and Autumn Schedule. We are very fortunate to have had Louise Davies as our chairperson. Throughout her funeral all who loved her wanted us to think of all our happy memories of Louise and there are many. Rarely does such a positive and thoroughly kind person become part of our lives. The society benefited greatly from her enthusiasm over many years. Louise entered exhibits to all the shows, grew many plants for the sales, always turned up early with her van full of whatever was needed that day, encouraged and praised new exhibitors and chaired meetings and events with good cheer. She will be missed and we are certainly richer from having known her. We have some new classes to enter so please check the schedule for inspiration. The new timing seemed to work well for the Spring show so we will continue with the new times. Size restrictions have been removed from the cut flower sections so let your creativity flow. There are interesting titles for both flower and photography sections. The unusual vegetable class can be entered on the day so watch out for some wacky carrots. This event keeps growing and plans are under way for this November. If you have any ideas please share them with us. As a result of the success of the plant sales entry will be free to members at our events. 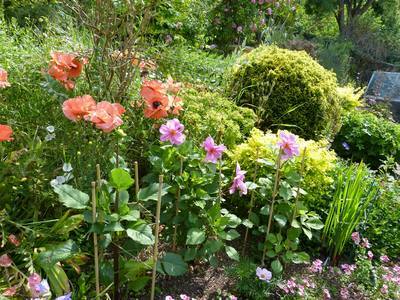 Four lovely and very different gardens opened to our members on a sunny afternoon. The gardens on Digby Road, Tan y Bryn Rd, and Bryn Euryn proved popular with a steady stream of visitors wandering, cycling and climbing between them. Exquisite planting, impressive vegetables, chickens, Italian cliff faces, fabulous views and even a pop up art gallery were appreciated by all. A massive thank you to the hosts. You must have been working very hard in the days before. You made everyone feel very welcome. There are some pictures on the website. We emailed the garden trail information to members so if you didn’t know about it we are very sorry. If you are able please let us know an email contact for you, a friend’s email if you don’t have your own so no-one misses out in future. Some emails bounced back so please ensure we have an up-to-date version. You can use the contact form on the website for this or see a committee member. A very successful day with over £900 profit that will go towards supporting the two shows we hold in Spring and Autumn. A big thank you to all those who grew and donated plants. The unsold plants were passed to sales in support of St Cystennin’s church and St David’s Hospice. A committee was elected and all business conducted satisfactorily. We then had a talk from our flower judge, Mr Evans, who gave us plenty of hints and tips for entering. Reading the instructions was one of them! A friendly chat and lovely cake helped make for a successful and informative morning. The changes seem to have worked well and I certainly appreciated the later start. We had some new exhibitors who did very well. The “Best in Show” red tulips were outstanding and there were some impressive and very large craft exhibits. The number of photography entries continues to grow and look great. As usual, the home produce was mouthwatering and well deserved the new “Best Exhibit in Home Produce” award being introduced. The new black tablecloths set everything off to perfection. A gallery of pictures is regularly updated so keep it as a favourite. We are on social media and have a facebook page “Colwyn Bay Horticultural Society” for public announcements and a private group page “Colwyn Bay Horticultural Soc. Chat” for horticultural chat and picture sharing. Anyone can view the facebook page and any member can request to join the group. Welcome to our Spring Newsletter and we do hope you will be inspired by our Spring Show Schedule. We have made some exciting changes to our Spring Show so read it carefully. Don’t forget to renew your membership, we had well over 100 members last year. An interesting speaker is lined up but cannot be revealed just yet. We will pop the news on the website once they are confirmed. Some big changes we hope you will like. · A later start, setting up is 5.30-6.30pm on Friday and 9.30-11.00am on Saturday so an extra hour in bed or running round the garden in pyjamas picking last minute flowers! Judging will start at 11.00am. · Afternoon tea, scones and homemade cakes will be served all afternoon. · A new award for “Best Exhibit in the Home Produce Section” in recognition of the excellent entries received. · Smarter displays that will better present the entries so that their full glory is revealed. These changes are the result of feedback from the last few shows and we welcome your comments on how they work. What about entering if you haven’t already. Could the photograph titles inspire you; Eyes, Extraordinary Events, Shadows or Welsh Magic? What about the floral arrangement “Spring has Sprung” or the table arrangement “On Reflection”. How is your baking or did the wet winter keep you inside working on crafts? Our extremely popular sale helps raise the funds that support our shows and other events. Some very special plants and seeds change hands. Many members are propagating in preparation for the sale. If you have any spare seedlings, cuttings or precious perennial divisions then please let us sell some and share what grows well locally. Please label them with as many clues as possible. There will be refreshments and activities for all. We are hoping to run another trail in Rhos on Sea this year. Several members have nearly been talked into opening their gardens to members. Please let us know if you would be interested too. A whopping 265 entries this year. As our website photos show, some very impressive and colourful flowers, vegetables, photographs and home produce. Some top prizes went to a few new names which included a very successful new vegetable grower. The lovely summer and a bit of graft resulted in a fabulous display. It was massive! Check out the website pictures. There was barely enough time to have a go at everything. All ages were kept busy planting, making, drawing, admiring jewellery makers and artists at work, sharing tips, eating cakes, winning chocolate, competing with floral teacups, chatting, spending, learning about wildlife, finding insects and stroking the magnificent owls. A great range of exhibitors and activities that included Andrew Jenkins, watercolour artist; Sonia Davies, wildlife gardener; Joy and the RSPB; North Wales Bird Trust and their owls; Janette Gilbourne, jewellery maker and the Anglesey Red Squirrel Trust. We have even more for next year. All the people that help out at our events moving tables, growing plants, making tea or cakes, washing up, running stalls, delivering letters, advertising, judging and supporting judges, banking, writing certificates, picking up or donating plants, compost or prizes, finding exhibitors, selling tickets, writing and printing etc etc. All the people that visit our events. All the people that enter the shows. Colwyn Bay Town Council for help with funding for equipment and children’s activities. Tal Goed Garden Centre for supporting the plant stall. You can use our new facebook page. We have some great photographs on the website from our May Plant Sale and Coffee Morning. Once again a big thank you to Colwyn Bay Town Council, Tal Goed nursery, the growers who donated some fabulous plants, the volunteers in the kitchen, on the stalls and raffle and everyone that spent money. Some really special plants changed hands. People enjoyed planting their own seeds to take home and there will be a good show of candytuft and sunflowers and some tasty salad leaves in many gardens now. We now have a contact us page on the website so you can ask a question or let us know of any events that might be of interest to our members. Another bumper show is expected and the lovely weather must be making gardens very productive after a slow start. We hope to see a few more vegetable growers enter this year to challenge the fabulous flower displays from last year. See if you can tempt some of our new allotment gardeners to enter now they are in control of their new patches. Don’t forget the family scarecrow entry. Check out the schedule included and let yourself be inspired. If this gets any bigger we will need a larger hall! A very popular event, there will be plenty of things to see and do. If you have any new ideas let us know, you can use the website to do this. We are hoping for more support from the Town Council to stage the event and to attract new visitors. We will use email and the website to keep as many of you informed about this as we can. Daffyd Lloyd-Borland gave an interesting talk about his garden and the visit from the Gardener’s World TV crew with Joe Swift. You can see his garden on his website www.gwelyrynys.com. A productive AGM took place and a full committee was elected and gratitude shown to those departing the committee with thanks for their hard work. Some people even managed to enter tulips when most daffodils kept hidden until May! Despite the cold weather there were many entries and the standard was high. Check out the pictures on the website. The cold did mean that the croci that the children planted at the Autumn Garden Event were in fine fettle and one pot won the best children’s entry. Many of you have already visited our website and seen the photographs from our Autumn Gardening Event, if you haven’t had a peak yet they are a treat. A big thank you to Colwyn Bay Town Council who supported the event and to the public who voted on how the participatory budget should be spent. The croci my children planted are just poking little leaves through the soil, they need to slow down or they will have flowered before they can enter them in the Spring show. Our annual general meeting includes a short summary of the previous year and the election of officers. Most of the committee have enjoyed their role so much that they are happy to continue helping out so you don’t have to hide if you don’t want a job! We do always welcome new ideas and the latest people to join the committee have suggested and helped with improvements to the show layout and the activities on offer at our events, amongst other things. We have a celebrity gardener to entertain us this year and there will be refreshments and good conversation on offer too. The schedule is included and has some changes to classes so why not see what you could enter. After the success of “book title” for floral arrangements in the Autumn Show we hope you will be inspired by “limited colour palette” and “afternoon tea”. Our photographic section has been getting very popular and there are some interesting titles including “a cold welcome” to get you thinking and clicking. See if you can get a craft exhibit or two completed in time too. Children that planted bulbs at the Autumn Event can enter their pot without being members and if it flowers too early send it in with a photo. We would love to run another trip this year so please pass on any ideas. The last trip to a private garden on Anglesey was a special day and very popular. The website has details of future events, newsletters, blog, membership info etc. Hope you are enjoying the autumn colours in your garden and get a chance to venture out between showers. We have been relishing our autumn raspberries and even the children had a good time picking apples. Though, when it came to storing them and cooking the woodlice infested ones for freezing they made themselves scarce. Gazing at my veg. patch, I am looking at a lonely pumpkin and thinking it hardly qualifies as such and is going to make a poor centre piece at the spooky birthday party my youngest has planned. Not had much veg. success this year! However, that did not stop an impressive spread by some at the last show. This has been supported by Colwyn Bay Town Council with the public voting for it to receive funding from the Participatory Budget. · Local expert, Mandy Coates, will be demonstrating basket making and there will be a chance to have a go at making something yourself and her marvelous creations will be for sale. · Meet celebrity local gardener, Dafydd Lloyd, who was recently featured on Gardener’s World. · The RSPB will be encouraging us to attract wildlife to our garden. · Local gardeners will be sharing tips and advice and we welcome your ideas too. · Our Greenfinger Family Fun section will have activities for children including bulb planting and weird fruit and veg tasting. · The popular plant stall will also have a selection of bulbs for planting on sale at excellent prices, so there will be no excuse not to have a fabulous spring display in your garden or pots. · Competition, a prize will be offered for the best floral arrangement in a teacup. You must have grown the flowers and foliage yourself but anyone can enter. Raffle, stalls, refreshments and much more. Admission £1 to include a drink, free for children. This show was dedicated to David Lysak who died recently. David entered the children’s section of the show over many years with great success winning many certificates and the children’s cup. He always put great effort into his entries and cheerfully chatted with many of the members. He will be missed very much by members of the society. Our Autumn Show was a very colourful experience this year. The number of entries was up on last year despite the terrible summer weather, what summer did I hear you say? We tried a new layout in the hall and going on the favourable comments received everyone liked it. I would like to thank the people who came along at 4pm on Friday to help us set up and those who stayed behind on the Saturday to help clear up for which we created a new record time. As the last one to leave on Saturday I was away by 5.15, brilliant. We now have a good team of stewards and our regular judges do a great job. Ann Yates and her kitchen team served us up a lovely meal and I would particularly like to thank the gentleman who washed up for two hours – what a man! Whilst every member of the committee works hard at these events we could not put these on without the extra members who help us out and we are very grateful to you all. If you are able to give us a hand setting up or clearing up at any of our events and want to see how it is all done do give one of us a ring or just turn up, we will be very pleased to see you. Jaqui Jones – Show Secretary. The website is up and running and has details of future events, newsletters, membership info etc. You are welcome to comment on the blog too. November 10th 2012 Autumn Gardening Event. Don’t forget to enter your teacup on Saturday, 10th November at the Autumn Gardening Event. Our Spring Show showcased some beautiful blooms, curious crafts and fabulous food entries. Show Secretary Jaqui wishes to thank all the volunteers that helped with refreshments, lovely lunches, stewarding, judging, furniture moving, running stalls and, of course, those that entered. With over 300 entries the display was stunning, but we can always do with more and committee member Marion shares some handy hints later on. The AGM and Grand Garden Quiz were well attended with the competitive spirit being unleashed as gardens were placed, pests squished, birds identified and celebrities spotted over the garden fence. Malcolm and Sue’s table won, again! I think everyone else has to up their game please! Most importantly the AGM business went smoothly (and quite quickly) and new committee members volunteered themselves to help keep the society on track and suggest new ideas. Our May Plant Sale and Coffee Morning was fabulous. Turning it into an enormous plant sale meant that many of us were able to buy some amazing homegrown plants and veg. There were some high quality finds including healthy cuttings from a delicate dark red geranium that Sarah Raven sells for £9 and interesting varieties of tomatoes. We plan to do this on an even bigger scale next May, so when you plant your seeds and take your cuttings please do a few extra for us to sell. We are planning an Autumn Gardening Festival for Saturday November 10th. The Green Finger Family Fun session added to the last November coffee morning was enjoyed by many children but we missed some of our older members. We plan to do more activities for families but if we win Town Council support we will have funds for activities aimed at older gardeners too. As well as the usual coffee and stalls we are hoping to invite speakers and crafters, possibly with a basket maker and beekeepers running hands-on sessions. Full details will be available at the Autumn Show. The voting took place on July 11th and you may have read results in the paper by now. Grant or no grant, it will be a good day for all ages. Unfortunately my charm has failed me and no one has offered their garden for a garden trail this year. The Rhos on Sea people have asked for a year off. I suspect this is to prepare something fabulous for 2013. The people of West End have not yet agreed but I shall keep applying pressure as I am aware of some great potential there. Why not give exhibiting a go? · If a class calls for several items of the same variety eg 9 pods of peas, choose evenly sized specimens, not necessarily the biggest. · The tomatoes in a 'truss of tomatoes' do not all need to be ripe! · Pot dimensions under 'Plants in Containers' refer to internal dimensions. · To prevent the dimensions of 'floral arrangements' from exceeding the maximum size try drawing an outline of the correct size on a piece of newspaper and place your container on this as you make your arrangement. · Spoilt for choice in a given class? You can make up to 3 entries per class! Follow the instructions under 'Entries' in the schedule and make sure your entry together with the fee arrive at one of the listed addresses by 5pm on Monday 10th September. You can join at this point too. You can set up your entries (known as 'staging') either on the Friday evening, 14th September between 5.30pm and 7.00pm or on the morning of the show, Saturday 15th September between 8.30am and 10.00am. Stewards will help you if this is your first time. All the hard work done, it's time to relax and let the judges do their job and then maybe pick up your prize money and certificates. The next newsletter will be delivered with the Spring Show Schedule. Before then do check out the new website which will be developed over the next few weeks.